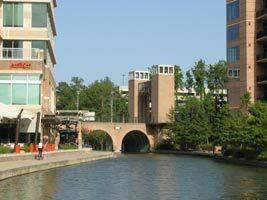 The Woodlands, Texas is a fun place to spend a weekend with lots of options for things to do including excellent golf, upscale shopping, lakes and boating, kayaking, biking, and much more. Along I-45 just north of Houston, The Woodlands is easy to get to from just about anywhere in Texas. 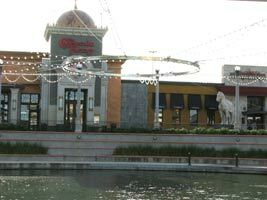 The weekend is focused on staying and playing at or near The Woodlands Mall. For accommodations for a weekend at The Woodlands, consider staying at the Marriott on the Woodlands Waterway - you can park your car when you arrive and never need it again - walk out your door and within a minute or so you can be enjoying the music at Mitchell Pavilion, shopping, jogging on biking on the trails, jumping on water taxi, or sitting on the waterway sipping a cold beer and munching on some good appetizers. Or check into the Woodlands Resort & Conference Center for good rooms, multiple restaurants, great pools, tennis, and 3 18 hole championship golf courses. It's is just 5 minutes from the Mall - read our review of The Woodlands Resort. 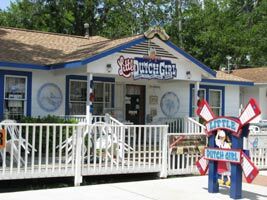 If you're traveling in your RV or want to stay in a small cabin, check out Rayford Crossing - it is also very close to The Woodlands and one of the best RV parks in Texas - read our review of Rayford Crossing RV Resort. Hit The Links - play any of the several excellent golf courses in the area - some of our favorites include: Panther Trails, Augusta Pines, Tour 18, and High Meadow Ranch. 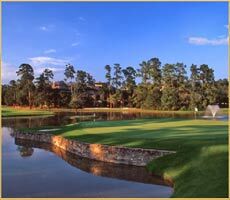 Find some choices and read reviews on The Woodlands Golf Map. Spend Some Money - The Woodlands Mall is a shopper's heaven with plenty of upscale places to spend your money or head down to Old Town Spring to browse the over 150 unique shops selling merchandise from around the world. Enjoy the Nightlife & Restaurants - in The Woodland's Mall and nearby you'll find cuisines from around the world (BBQ to Vietnamese) and several places to hangout until the wee hours, some of our favorites include: Dosey Doe for live music in an 150 year old barn from Kentucky, Brio for Italian, Pho Be for Vietnamese noodles & soup, Cheesecake Factory for way to much food, Rockfish for Seafood, and the The Goose's Acre Bistro & Irish Pub for nightlife and sitting outside along the waterway. Get Some Exercise - after an evening of eating and partying, you need to go biking, jogging, or running on any of the many miles of paved trails meandering through The Woodlands. 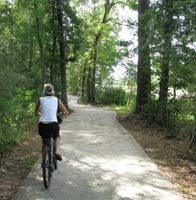 We enjoy riding bikes on the waterway trail and then down to Lake Woodlands and around the area - a flat, paved, easy trail. 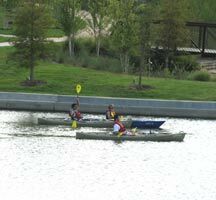 Or rent a one or two person kayak and paddle from The Woodlands Mall to the Lake Woodlands and back - you can rent kayaks at the Riva Row Boat House which is at the end of The Woodlands waterway. Play Tourist - pay the money and treat the kids to a ride on the water taxi - one price covers rides all day. Or take the kids to nearby Splashtown to play in the water park - they'll love you forever and will be on their best behavior for at least a couple hours to say thanks! There is also a water feature and water spouts for the kids to play in along the waterway near the Marriott. 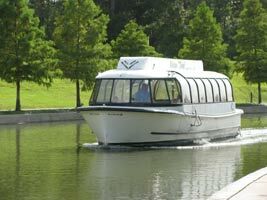 Listen to Music & More - schedule your trip around an event at the Cynthia Woods Mitchell Pavilion on the waterway - a fantastic outdoor venue with plays, concerts, and more. Go Boating - zip over to nearby Lake Conroe and rent a waverunner, ski boat, or pontoon boat and spend some time cruising by the beautiful homes, swimming, bar hopping, skiing/boarding/tubing, or fishing. Our Lake Conroe Map has fishing guides, boat rentals, restaurants, and more. Enjoy some or all of the above and you'll drive home saying, "that was a fun, action packed weekend, what are we doing next weekend to replicate it?"